Q: First and foremost, people know you for your music but you’re quite the imaging enthusiast too, tell me about how that first started. A: Photography has always been a passion of mine because my dad was a photographer, not by profession but by hobby. He taught me how to take my own pictures and develop them in the darkroom which was great to see, so it was an early thing that fascinated me. As for stereo photography I stumbled upon it because of Weetabix really; when I was a boy you used to get all these toys in cereal packets, it used to be so exciting, and one of them was a 3D card. It was a tiny card and it looked very ordinary with two pictures that looked the same, but then you sent off one and sixpence for your stereo viewer, put the card in and suddenly these two little drab pictures turned into this sort of window that you could walk through. It was magical to me. I just thought ‘if this is the way that photography could be done then why doesn’t everybody do this all the time?’. Q. How did you first find the Diableries? A. I was on Portobello Road looking for little treasures and there was this yellow stereo card and I was immediately astounded and intrigued because there were all these skeletons and devils doing strange things, having fun, and I couldn’t believe what I was looking at. 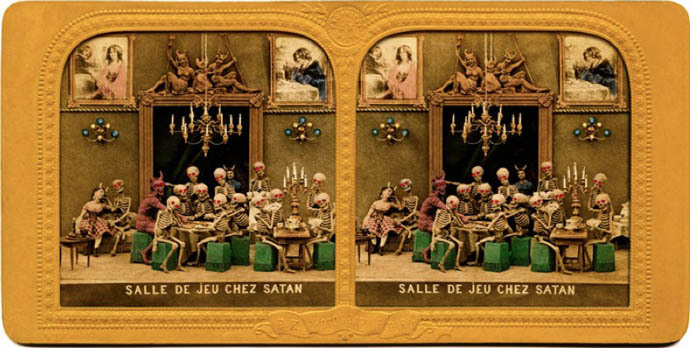 The funny thing is that no one else did either – even the experts in the stereoscopic industry couldn’t tell me anything about these Diableries – so it became a passion and I started collecting them from all around the world. So I would be playing in Chicago, Detroit, Brussels, Australia, looking for a stereo dealer in the city, and occasionally I would find these cards. The detail is extraordinary and each of them tells a story. Sometimes they’re quite religious, warning people what happens in hell if you’re a bad boy, some of them start to become funny because they see hell as a fun place, but there’s a whole undercurrent of satire because really this was a political instrument as well. They were using these to make fun of Napoleon III, his wife, his mistress and the government at the time, and it was completely illegal. Every single card that we could find, 180 in total, have all been restored for the book. And because this device is in the book as well, my special unique patented Owl viewer, you can see them in 3D exactly as they were seen in Victorian times. It’s something I’m very proud of. It was always a dream from the very first days when I saw my first skeleton through the stereoscope, I wanted to make this book. Q. How was it making the Owl? A. Well this is something of analogue technology. 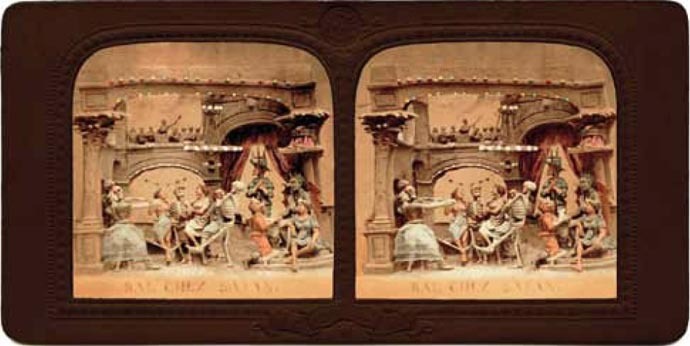 Victorian stereoscopes were beautifully made out of walnut and mahogany, you couldn’t possibly do that these days – if people are going to see this in stereo as is intended, how is it going to happen? So I had to actually invent this, and I was lucky in finding a little company that helped me transfer my plan into a mould. And this Owl is fully focusable, which is a big deal. Q. 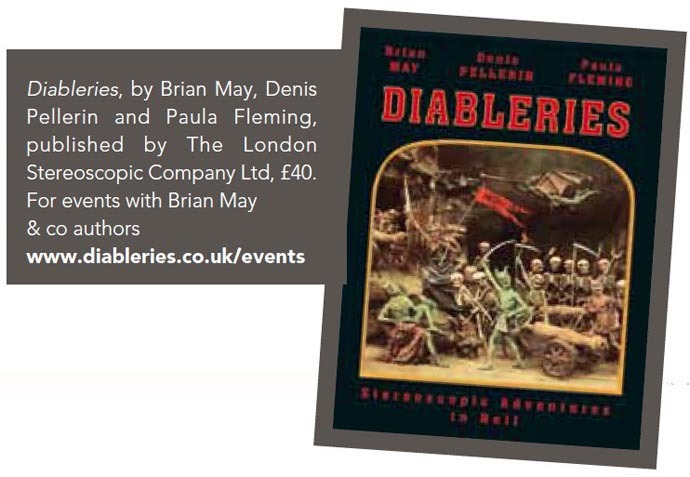 Was there anything that particularly surprised you when researching the Diableries? A. Loads of things surprised me, and I’m still finding things which surprise me. The whole satirical undercurrent surprised me, I didn’t realise how seditious these things were – it’s a wonder how they got away with it. What surprises me still is that we managed to get them in book form where they work very well, we’re also producing cards too. Q. As this is your second book, there must be quite a following. A. It’s not mainstream, this is never going to be Harry Potter, but thereis a growing band of appreciators. The previous book was very quiet and peaceful, it was based on scenes in a little village in the 1850s. This is not gentle, this leaps out and grabs you and shocks some people, makes some people laugh, some people feel a little uncomfortable about it, which is valid because there are some pretty heavy things discussed. Q. What I love when looking at the book, although it explores the Victorian era, you also show that 3D images can be achieved on a smartphone. A. The iPhone is quite good at it and there are a few apps that you can download which help you, so it’s really easy to do. You can then print out your pictures, mount them in the Owl viewer and you’ve got stereoscopic pictures of your family, friends and things that are going on around you. You can photograph the moon and the stars, which is what I do, it’s just endless what you can achieve. Q. What’s the feedback been like on the book so far? It’s been very well received. It just feels good. It has been a labour of love because of the time that has gone into it, you can’t do this type of thing if you want to make money, and luckily I don’t need to make money. I have spent hours in Photoshop restoring every picture in this book. I tend to be transparent, I want the artistry of the people to shine through. Read about how stereo photography played an important role while on tour with Queen and how photography and music make perfect harmony for Brian May in the next issue of Photography Monthly.